The thermal power station is equipped with high-performing installations, which guarantee an availability rate of over 90%, making it one of the best performing power stations in the world. The preventative maintenance program is carefully planned to ensure the best results. Good operations at the thermal power plant of Jorf Lasfar rely primarily on an extremely rigorous maintenance program that improves the reliability of the power plant and ensures the best results. Each major maintenance cycle is carried out by 750 supplementary contractors who work 24 hours a day, 7 days a week. 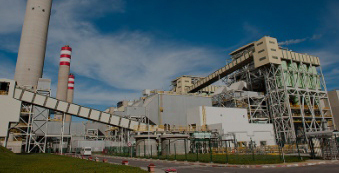 The maintenance policy of TAQA Morocco keeps in mind the pre-established program for the planned closure the units on the basis of an 8-year cycle. This includes the three categories of overhaul for maintenance: Simple overhaul for inspection 7 days Minor overhaul: 21 days/25 days Major overhaul: 42 days. 4 main ambitions of the preventative maintenance policy. The Thermal power station enjoys a strategic geographic location thanks to its close proximity to the Jorf Lasfar Port. 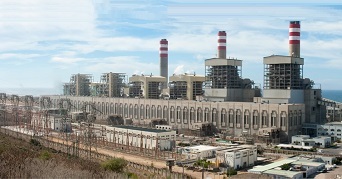 The coal-fired power plant is a key link in the electricity-producing sector in Morocco, around 85% of coal imports destined for thermal power stations pass through this terminal. The coal park for the Thermal power station at Jorf Lasfar has a storage capacity of 1 million tons, and enjoys a neighbouring supply of coal to the amount of 5.4 million tons/year. With JLEC 5&6 and the subsequent change in the production capacity, the Jorf Lasfar power station will carry out an expansion and improvement program on the coal terminal and coal park facilities. This will help boost performance in unloading coal, to reach a total capacity of 10 million tons of coal. The thermal power station has a contract to use quays 3 and 3 bis for a period of 30 years. •The construction of a new quay (3 bis) 300 meters long, with 16-metre draft, able to dock 120,000-ton ships and ensure the traffic of over 7 million tons per year. This will let the power station significantly increase its coal capacity. •The supply and installation of two boat unloaders, each one capable of 2,400 t/h. •The supply and installation of a new conveyor belt with a capacity of 2,400 t/h. •The supply and installation of a new stacker with a capacity of 4,800 t/h. •The refurbishment and expansion of Quay 3 to 300 meters long, with a 16 m draft. •The extension backwards of the conveyor belts, existing and new, by 60 m and 300 m respectively. •The coal terminal is certified ISO 9001-2008 by Lloyd’s Register Quality Assurance Limited.